Does this homemade version of the popular take-out lo mein dish spark joy? For us the answer is a resounding: yes, it certainly does! Not only is it easy to cook, it is full of health-giving vegetables and it is guaranteed to become your quick-to-fix Asian noodle stir fry for those days when nothing else will do. Zucchini noodles are becoming more and more popular, thanks to the invention of the spiralizer, but don’t run out and buy one just yet, because you can make similar noodles with a mandolin or a hand peeler. The noodles may not look exactly the same, but it won’t change the flavor one bit. It is your choice of cooking oil, however we are going to recommend sesame oil here for the flavor alone – it gives the lo mein that distinctive Asian feel that you are going after. Sesame oil is rich in Vitamin E and is extremely high in antioxidants, at the same time it contains a wide range of polyunsaturated fatty acids which may in fact help to lower your cholesterol. Eating wisely is a choice we make every meal, just make sure what you are consuming is right for you. 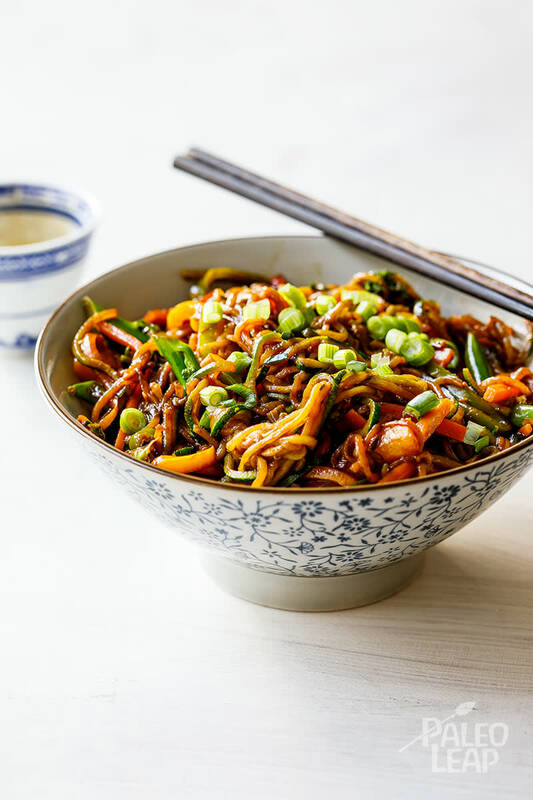 Now, this vegetable lo mein stands proud on its own, yet you can add to it if you need to maintain your energy levels throughout a busier than normal day. It is equally wonderful with shrimp, chicken or pork. Go for it and try a new variation for lunch every day of the week!